Proposed method, called Probabilistic Nodes Combination (PNC), is the method of 2D curve interpolation and extrapolation using the set of key points (knots or nodes). Nodes can be treated as characteristic points of data for modeling and analyzing. The model of data can be built by choice of probability distribution function and nodes combination. PNC modeling via nodes combination and parameter ? as probability distribution function enables value anticipation in risk analysis and decision making. Two-dimensional curve is extrapolated and interpolated via nodes combination and different functions as discrete or continuous probability distribution functions: polynomial, sine, cosine, tangent, cotangent, logarithm, exponent, arc sin, arc cos, arc tan, arc cot or power function. Novelty of the paper consists of two generalizations: generalization of previous MHR method with various nodes combinations and generalization of linear interpolation with different (no basic) probability distribution functions and nodes combinations. 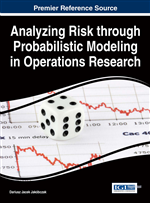 Probabilistic modeling is still a developing branch of economic and computer sciences: operational research (for example probabilistic model-based prognosis) (Lorton, Fouladirad & Grall, 2013), decision making techniques and probabilistic modeling (Pergler & Freeman, 2008), artificial intelligence and machine learning. Different aspects of probabilistic methods are used: stochastic processes and stochastic model-based techniques, Markov processes (Cocozza-Thivent, Eymard, Mercier & Roussignol, 2006), Poisson processes, Gamma processes, Monte Carlo methods, Bayes rule, conditional probability and many probability distributions. In this paper the goal of a probability distribution function is to describe the position of unknown points between given interpolation nodes. Two-dimensional curve is used to represent the data points and extrapolation of the unknown values enables analyzing risk and then decision making. Curve interpolation (Collins, 2003) represents one of the most important problems in mathematics and computer science: how to model the curve (Chapra, 2012) via discrete set of two-dimensional points (Ralston & Rabinowitz, 2001)? Also the matter of shape representation (as closed curve - contour) and curve parameterization is still opened (Zhang & Lu, 2004). Operational research in planning and scheduling, also decision making systems in risk analysis, solve the problems which are based on data modeling and extrapolation via the choice of key points. So interpolation and extrapolation is not only a pure mathematical problem but important task in economic and artificial intelligence. The paper wants to approach a problem of curve modeling by characteristic points. Proposed method relies on nodes combination and functional modeling of curve points situated between the basic set of key points and outside of this set. The functions that are used in calculations represent whole family of elementary functions with inverse functions: polynomials, trigonometric, cyclometric, logarithmic, exponential and power function. These functions are treated as probability distribution functions in the range [0; 1].